(Nanowerk News) The ouroboros (ancient Greek for "tail devourer") is a motif found in many cultures: a snake biting its own tail, it symbolizes eternity and cycles. Julius Rebek, Jr. and Fabien Durola (The Scripps Research Institute, La Jolla) have now constructed a molecular tail devourer, and have named this new class of compound "ouroborand". 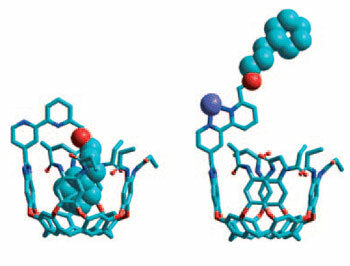 As the researchers report in the journal Angewandte Chemie ("The Ouroborand: A Cavitand with a Coordination-Driven Switching Device"), their tail-biter is a molecular "machine", which functions as a nanocontainer with a built-in switch that regulates access to the cavity. Molecular machines and nanoscopic components imitate -- at least theoretically -- the functions of their macroscopic analogues. For example, nanoscopic capsules can act as reaction vessels, molecules with parts that rotate relative to each other to imitate rotors, and various types of on/off switches.